Start investing profitably with as little as $50! The $50 Wealth-Builder; How to invest in stocks, bonds, real estate, gold & silver etc. starting with as little as $50! 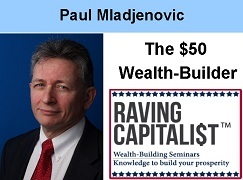 Fromthe author of Stock Investing For Dummies Paul Mladjenovic. Start investing safely with as little as $50! * How to make 18% interest income…guaranteed! I have been doing this seminar for nearly 30 years! Hundreds of thousands of individual investors have benefited and have grown their wealth. Now this profitable information has been updated and you can take advantage for a tiny cost and from the convenience of your home or office. Start your journey on the wealth-building path to financial success…click on the button below and start your journey on the path to financial independence!